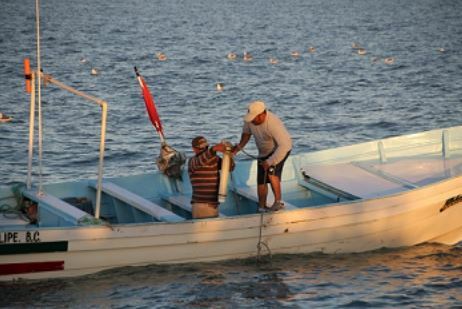 Vaquitas in the Gulf of California. Photo credit: Paula Olson 2008. A new study using acoustic detectors has documented a yearly decline of 34 percent in the population of Mexico's critically endangered vaquitas. Fishermen from a local fishermen’s community organisation, Pesca ABC, working with SEMARNAT to launch the acoustic monitoring devices. For the new study, researchers incorporated one of the most sophisticated networks of acoustic detectors and used the acoustic array to monitor the population by listening for the vaquita's calls. A new abundance estimate using acoustic monitoring that builds on last year’s abundance estimate is expected out soon. A companion paper published in Conservation Letters estimates the population to be about 60 individuals last year, based on both acoustic and visual surveys. The vaquita's population has dwindled to this extent because it frequently ends up as bycatch in gillnets meant for the totoaba, a fish whose swim bladder is highly prized in China. According to a report by the Environmental Investigation Agency, totoaba bladders are now worth up to $5,000 per kilogramme and the price can shoot up to $100,000 on the black market in China. Despite the Mexican government's actions to protect the animal – by setting aside half of the vaquita's range as a no-fishing zone, implementing a two-year ban on gillnet fishing in April 2015 and compensating fishermen and related industries – both the vaquita and totoaba continue to be on the endangered species list. The research findings showed that the vaquita population's decline had instead accelerated, along with a resumption of illegal gillnet fishing for totoaba. Three vaquitas killed in gillnets were recovered during surveillance activities last spring. In addition, alarming quantities of totoaba gillnets have been found and removed in recent months.